This wonderful new front garden design located in south county Dublin is a wonderful addition to this period mid terrace home, adding to the gorgeous frontage of the house and giving it great kerb appeal. 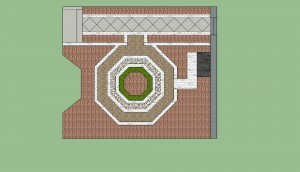 The garden design is structured and in tune with the period design of this residential area. planted with roses. 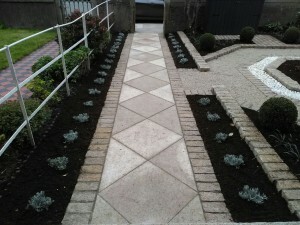 A matching hexagonal path encircles the central border with a finish of white beach cobbles set in cement nearest the centre and borders filling the remaining space between the path and the boundaries. maple planted in the other corner adjacent to the road. The bane of so many front gardens are wheelie bins which must be stored somewhere accessible for easy transfer to the roadside each week. In this garden the wheelie bins are stored in a custom-built wooden container settled adjacent to the front wall of the garden which will be painted dark grey to help it recede into the background. When the planting matures it will also be screened by some shrubs to the fore and the mature Japanese maple. The unit has a hinged top roof and two front doors to allow for ease of access and manoeuvrability and is accessible by the grey granite cobble path linking to the central gravel paths. 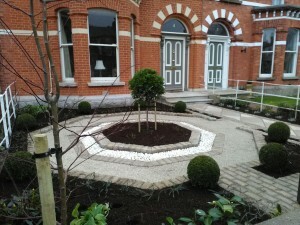 Beautifully designed and planted by Garden Design Dublin and expertly constructed by Think Outside.